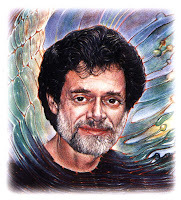 Terence McKenna: (8.6.8) Most popular psychedelic author, techno shaman and skilled orator. McKenna devoted his life to the study of the ontological aspects of shamanism and the effects of food and drugs on human states of consciousness. Born on 16 November 1946, with Sun in Scorpio, Moon in Virgo and Ascendant in Scorpio (8.6.8). One of his most intriguing theories regards the origin of the human mind and culture. McKenna argues that some of our primate ancestors left the branches and took up a hunter life out in the open following around herds of ungulates (hoofed mammals) and eating what they could along the way. Among the new ingredients of their diet were psilocybin-containing mushrooms growing in the dung of these herds. One of the changes caused by the use of this drug was synesthesia (the blurring of boundaries between the senses), which caused the development of spoken language: i.e. the ability to form pictures in another person's mind through the use of vocal sounds. McKenna also believed that tryptamine-based organic hallucinogens, such as those found in ayahuasca and psilocybin, were tools for communication with other forms of life in the universe, either in what he called "hyperspace" or even literally on other planets. He was intrigued especially by the fact that hallucinogen users seemed to go to the same multi-dimensional places, realms inhabited by entities he referred to as "self-transforming machine elves”. Among his numerous books, Food ofthe Gods is probably the most popular and also the one more closely associated with his birth binary 8.6 (Sun in Scorpio and Moon in Virgo). The book is a detailed account of food and drug use throughout human history. McKenna was particularly against refined sugar for its addictive qualities and negative health effects, pointing out its devastating impact on human consciousness. He stressed that numerous wars were fought over sugar, with entire generations being condemned to slavery in the service of its cultivation, as opposed to the innocent mushroom which only ever wanted to make people happy. McKenna affirmed that plant hallucinogens are threatening for current cultures because they undermine authority structures by democratically giving all users equal access to the big picture: "Because modern institutions depend on the transmission of a certain world view and then willing acquiescense in the truth of that world view by the populations into which it is being exported. In other words a kind of cultural brainwashing is necessary for modern cultures to work at all. The consequences of the acceptance of this situation of brainwashing is further acceleration toward catastrophe."